I have transformed my DNA using pGEMT vector in E. coli. I have Nde1 and Xho1 as my up and downstream overhangs. My question is: Do i have to do digestion using EcoR1 alone first, streak another plate and send that for sequencing to confirm my insert? Then, i can do double digest with Nde1 and Xho1? I went ahead and did double digestion without going the EcoR1 route. 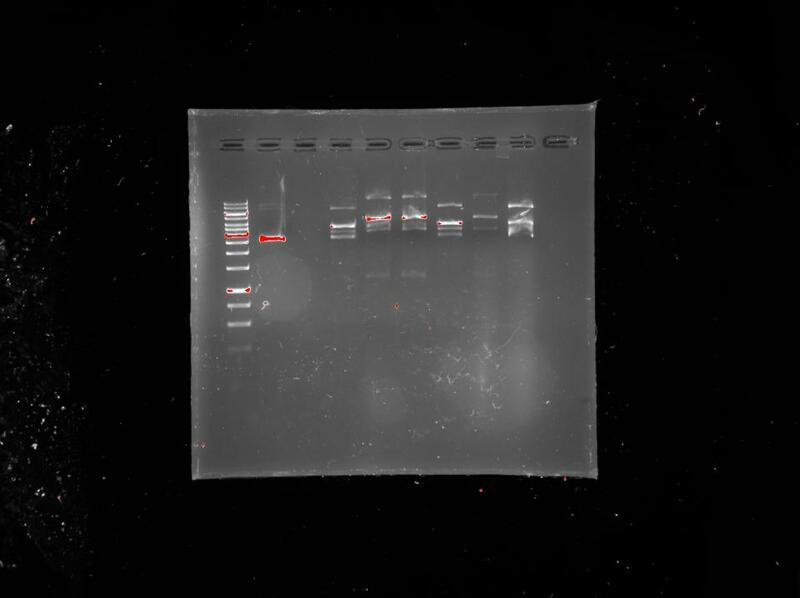 I have attached the results of the gel for that, were lane one is 1kb ladder, lane to is control without the enzymes, and the rest are my samples. I'm a little lost here - why do you want to do an EcoRI digest, and why are you streaking plates? Normally if you have an insert you will either be able to see a size shift compared to the empty vector (insert size dependent, of course); or you can do a simple screening like PCR amplification using one primer that is based in the insert, and another that is based in the plasmid. For your gel, you need to tell us what we are seeing - how big is the plasmid to start with? How big would it be with insert? Is this just insert we are seeing or is it plasmid and insert? What are the controls, and what should they look like? How much DNA did you load? EcoRI has restriction sites on both sides of the insertion point in pGEMT. Meaning if i expose my sample to EcoRI, i should end up with 2 sorts of fragments: 1 representing the vector (300bp or 3kb) and the other representing my insert (1197bp). 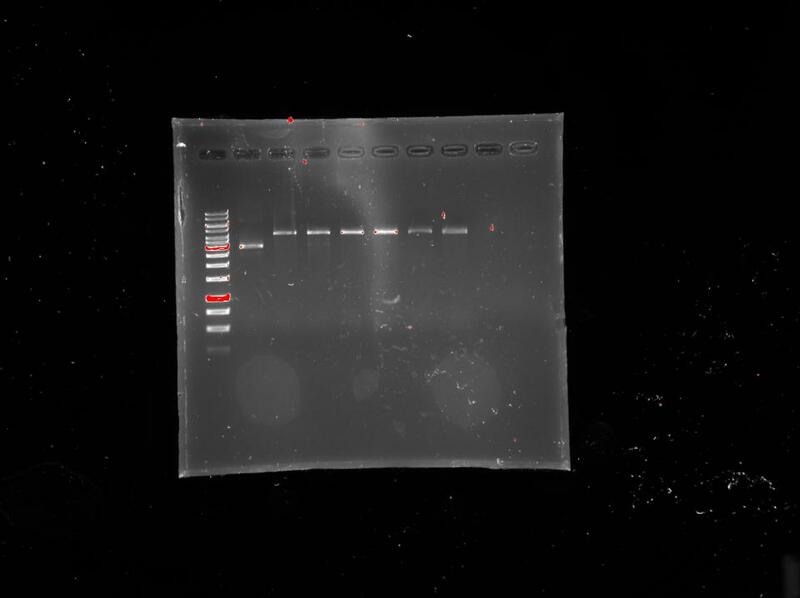 The streaked plate is the one with PCR colony, sorry for that, which i have to send for sequencing to confirm my insert. For the gel: The plasmid is 3000bp long, so with insert it should be 4197bp long. The first lane is 1kb ladder, lane 2 is plasmid with insert but NO restriction enzymes (control), and the rest are my insert + Vector + enzymes. 6 samples in total but the first sample is the control. In each i added 3uL of my DNA, 42uL water, 5uL O buffer and 1uL of each restriction enzyme. I do however, feel like my transformation could not have worked but what is those bands on the Gel representing? My insert can NOT be higher than the vector. Ok, I understand now. As a screen I would do colony PCR directly off the colony - for this, I would pick a colony, streak a small line on a fresh plate (as a backup, and so you have something to go back to when you get a positive, use the same plate for lots of streaks, just draw a grid on the bottom so you know which is which) then dip into 100 uL ultrapure water (or the other way around; dip then streak). Use 1 ul of the water in a PCR with either primers anchored on either side of the insert, or primers for the insert only, or with a primer on the plasmid and a primer on the insert. For options 1 and 2 there you can have a positive control hopefully, the third option doesn't have a positive. As you are putting a big insert into a relatively small plasmid, you should easily be able to see the size shift on a gel, as it will change from about 3000 to over 4000 bp. To do this, ideally you would linearize the plasmid so that you are not contending with supercoiled DNA and those sorts of things, so a single cut should be sufficient. Your EcoRI digest should be fine too, though you should include a positive control so that you know it is cutting. For digests you need to make sure that you are digesting the right amount of DNA under the right conditions - use an excess (2x) of enzyme relative to the DNA amount and do a short digest (1 h at 37 C is common), not overnight or any extended period. From your gel, I would guess that your digest hasn't worked, but it is a little hard to tell as I can't work out the size of the bands. If you can work out the band sizes, then you should be able to tell what is going on. Are you sure this is 1 kb DNA ladder from Invitrogen/Thermo fisher, could it be 1 kb plus ladder or from another company? You also say you have a control of DNA + insert with no enzyme - which sample does this DNA correspond to, or is it an unrelated DNA that is cloned in here? The marker is 1kb DNA ladder from Thermofisher, there is a faint band at the bottom (~250bp). The control consist of the same DNA used for other lanes. Update: I did the EcoRI digest, if only i could upload the gel here on replies but i cant. Well, i got my insert in lane 2,3 and 5 (although a bit faint). But i also got 3 weird bands on top of my insert which i cut with EcoRI (maybe my ligation did not go well, or some contaminants, or ratio of DNA vs Enzyme was not right). The control band which was not cut was ~4000bp. Now that i have confirmed my insert, i was thinking of combining the remaining 3 samples which had my insert, streak a plate, take half of positive clones and go directly and do a double digest with NdeI and XhoI. The remaining positive clones on the plate i will take them for sequencing to confirm my insert. Does this sound like the right way to go from here? You should be able to attach an image, you can go through the "My Media" button, next to the emoji one in the reply box, or use the "more reply options" in the lower right corner, next to the post button. Great that the cloning is working. The weird bands might be the result of star activity. Typically it is not a great idea to combine individual colonies for this sort of thing as individual clones can have errors from the PCR step you used in the cloning process. I would take a few colonies, grow them individually in liquid medium, make a frozen stock and extract the plasmid for sequencing. Once you know you have a correct sequence, then I would grow up more of that particular clone and use it to do the rest of the process. Managed to attach my gel. Lane 1 represent 1kb marker, lane 2 is control without EcoRI (2.5uL DNA + 6.5uL water +2uL Buffer). I then skipped lane 3 and loaded my samples from lane 4 to 9. My insert are visible (though faint) at lane 5, 6 and 8 (~1197bp), if only u can enlarge the gel, u will see them. The rest of the bands on top are probably some sort of contamination or star activity as you put it. 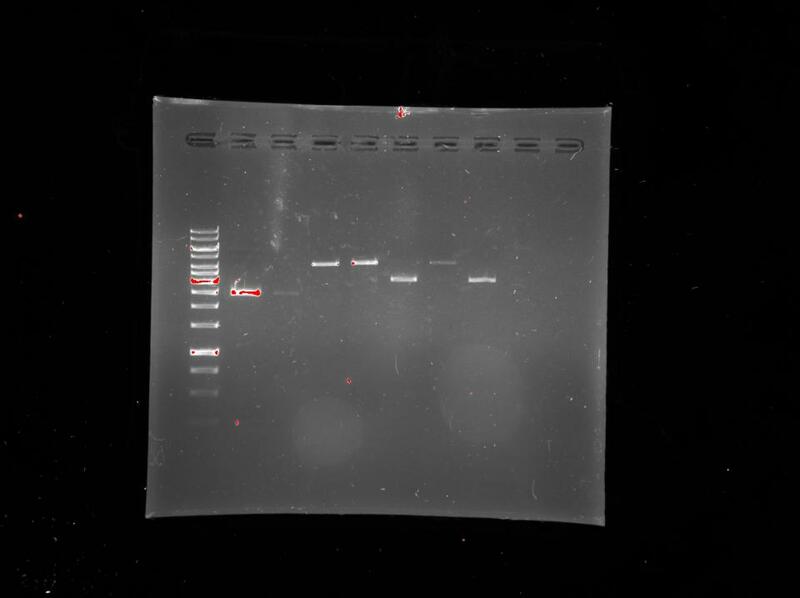 Just for comparison, i have also attached by PCR amplicons gel (duplicate) confirming my DNA at ~ 1197bp. Would really appreciate your response ones again. Forgive me for asking too many questions. Now that i had identified that 3 of my samples contain my insert, how do i go about it streaking my plates again with this 3 samples containing pGEM-T and my insert? Am thinking too hard and i cant get around this. It depends on what you have - if you have a plate with a small streak taken from a colony when you picked them for insert checking, then you would lift from that - you don't need to re-streak in this case, but you can if the plates are more than a week or so old, in which case the antibiotics may have deteriorated and re-selection would be a good idea. If you have just the DNA - then you will need to re-transform, spread a plate and pick it. If you have a frozen/glycerol stock, then you can just use that to streak out a fresh plate, or even directly inoculate a liquid culture. Am gonna re-transform using the 3 sample DNA that showed my insert on the gel. I will then prepare glycerol stock using positive clones from the transformation i am going to do so that i dont have to "re-transform" again. I have ran out of Plasmid Miniprep kit, so i will have to use the traditional alkaline lysis method, which i have not done before, hope and pray it works out. I will keep you informed as i appreciate and value your unreserved knowledge you have been sharing thus far! The alkaline lysis works well, I've used it routinely in the past. Just pay strict attention to the times for the initial lysis and neturalization steps, and make sure you don't overdry the DNA at the end. Actually, the kits for plasmid preps are all based on the alkaline lysis method, so the steps are essentially the same, other than that the kits generally use a filter to get trap the DNA, rather than spinning it down. Things seem to have gone from bad to worse for me. I started from the beginning by doing pcr, which works every single time, BUT the concentration after gel purification (GenJet Thermo Scientific kit) is very low (25ng/ul). I try to increase the wells by taping the gel comb, which i did the first time and worked, but this time, when i tape, i dont get a very good desired product run. What can you recommend i do to have a high DNA concentration following Gel purification or prior to? Really frustrating! Do you know about "nested PCR"? How does one go about it? I am running out of my DNA and would rather amplify ones and use that pcr product as a template. If you are amplifying the DNA with restriction sites on your primers, I would just purify the DNA from the reaction, then digest (you can do double digest for Nde and Xho, buffer 4 from NEB - if you are not using NEB, check the guidelines from your supplier). After this step you should only be getting rid of tiny fragments of less than 20 bp, which should not come through any purification procedure (they are too small to spin down easily for precipitation procedures, and too small to bind to columns efficiently). You should then be able to do a ligation with the end result, no need for gel extraction. Nested PCR is where you take a second set of primers that are inside the amplicon of a first PCR and use those to re-amplify the product. You can not use this easily to get full length product! It also increases dramatically the chance of there being an error in the final sequence. I would avoid if possible. Back to restriction enzyme digestion. I did a restriction enzyme digest as follows (50ul total volume): 39ul dH20, 3ul DNA, 5ul O Buffer, 1ul NdeI and 2ul XhoI. The digestion was carried out for 3 hours at 37oC in a heating block. 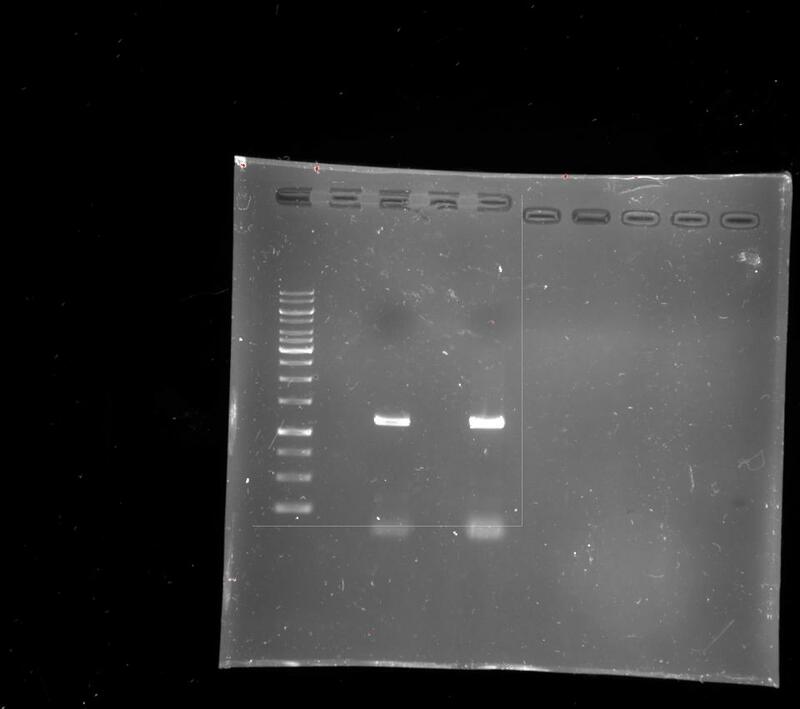 I have attached the gel of 7 samples of which 6 had all the reagents including enzymes and the first one had no enzyme. My insert is 1197bp and the vector is 3000bp (pGEMT). One of the enzyme expired in 2013 and the other is meant to expire in 2019. I think the enzyme are not cutting because if you remember from my post above, i said i once cut with EcoRI and it worked (for 1 hour). Having said that, i have left my digestion reaction at 37oC for over night. I will then run a gel to see if the overnight reaction was enough for the enzyme to cut. If you have any suggestions, please help a new scientist out.